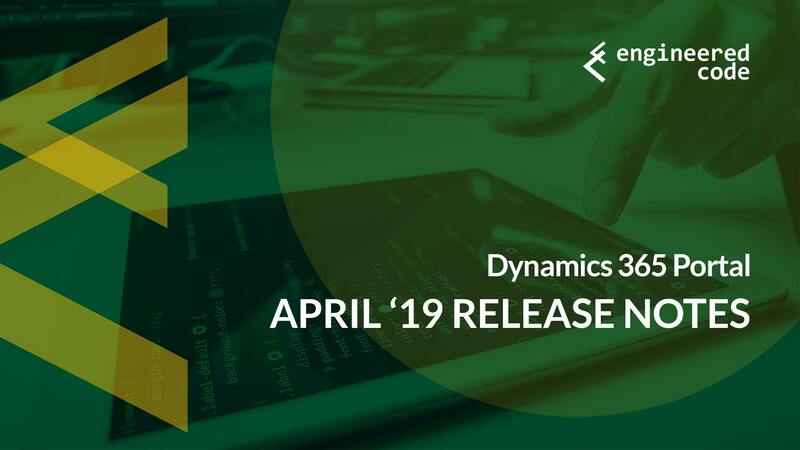 The April ’19 Release Notes were published on Monday – at over 300 pages, there is a lot to digest! In this post I’ll discuss highlights related to the Dynamics 365 Portal product, including CDS starter portal, maintenance mode, PowerBI enhancements, and more! In terms of dates, the releases notes mention that features can be released anytime between April and September 2019, which lines up with the twice-per-year cadence, as we can then expect October ’19 release notes to cover the next six month period (like we got with the October ’18 release notes). That being said, the time frames for the Portal-specific features all set the expectation that we should see them in April 2019 (the release notes make it clear that April 2019 means at some point in the month, not necessarily at the beginning of the month), with some features being generally available, while other will be in public preview. This is the one we’re most excited about – the ability to install a Portal in the CDS environment without requiring any of the “first party” (i.e. Sales, Customer Service, etc) apps. This will truly make the Portal product a part of the Power Platform, and open up even more possibilities. Microsoft has been working on decoupling the Portal from some dependencies on some of the first party apps (for example, the Portal solutions currently have a dependency on the Case entity). While I’m sure this was no small undertaking, allowing us to add a Portal to a project leveraging the CDS platform means even more organizations can make it easy for their external users to interact with Power Platform data. I haven’t heard anything official about licensing, but if I had to guess, you probably won’t get a free Portal license if you just purchase P2 licenses. In that case, you’ll need to purchase the Portal Add-on subscription. This is scheduled for Public Preview in April 2019. I’m excited to see the tool in action, as the original tool (without these enhancements) is still not released yet (keep in mind that we’re still within the October ’18 release window), and no doubt these enhancements will make it even better. This is scheduled for General Availability in April 2019. Another improvement to something included in the October ’18 release, the Power BI integration will now support Power BI Embedded. This is a big deal because it allows you to share Power BI reports and dashboards with Portal users that don’t have a Power BI account – previously the integration relied on the Portal user’s Azure AD account. With the big wave of customers upgrading to v9 over the last little while, a common question was “what happens to my Portal when my Dynamics instance is unavailable during an upgrade?”. Unfortunately the answer was typically it would not work, and would often fail in an ugly way. With the April ’19 release, Microsoft is adding the ability to display an “under maintenance” message instead of the ugly error. This feature includes the ability to enable or disable the maintenance page from the Portal Administration Center (which is available even when your Dynamics instance is not), plus the ability to customize the message that is displayed. If I had to guess, this was probably a pretty straight-forward feature to add. As I’ve mentioned a few times (especially in my last post where I had an entire section on the architecture), the Portal is essentially a web application that uses Dynamics as its database. When the database is unavailable, the Portal doesn’t have access to data it needs to render pretty much all aspects of the site (remember that the header, footer and what’s in between mostly all comes from Dynamics). However, to create a page that doesn’t rely on a connection to Dynamics is not that hard (we used to do it all the time with Adxstudio Portals) – my assumption is that the custom message is not stored in Dynamics, instead it’s stored in their central management database (the same place any configuration made via the Portal Administration Center is stored, which if you haven’t noticed, isn’t in Dynamics). This is a great little enhancement this will make a lot of people happy, and is scheduled for General Availability in April 2019. In the meantime, if you have some downtime scheduled before this feature is available, we recommended that while the downtime is happening, update the DNS record you’ve pointed at your Portal to point to another server that hosts a simple maintenance message (this can be done easily with Azure Web Apps). As a bonus, reduce the TTL on the DNS record so that users don’t cache the temporary DNS information too long, and they’ll get back to the Portal more quickly once it’s back up. If the CDS Starter Portal was the most exciting, this one is the most intriguing. It’s not quite the client-side API we were hoping for (see the next section), and the description is a bit vague, but my reading of it is that we’ll get the ability to secure our external services (in a lot of cases, this could be a companion app) using the Portal as an authentication provider. This would be helpful, as right now synchronizing authentication between a Portal and another application is tricky (but not impossible). I believe the idea here is that the Portal will have a endpoint that we can use that will provide us with a token containing claims indicating the ID of the contact that is logged in. If Microsoft makes this dead simple by allowing us to secure our own APIs using the Portal authentication, that will make our lives a lot easier. The one part that is confusing me is the title – it mentions “displaying external data in portals”. If this is what I think it is, then I think it could be used to not only display data from external systems, but also display and edit data from Dynamics. I guess we’ll find out when we get more details. Nicholas Hayduk is a licensed Professional Engineer, and the owner of Engineered Code Consulting Inc, a Regina, SK, Canada-based firm that specializes in helping companies solve business challenges with web-based solutions. Engineered Code builds on a variety of different platforms, but some of our favorites include Microsoft Dynamics® 365/CRM, Adobe® Business Catalyst and WordPress. Engineered Code is a web application development firm and Microsoft Partner specializing in web portals backed by Dynamics 365. Led by a professional engineer, our team of technology experts are based in Regina, Saskatchewan, Canada. © 2018 Engineered Code Consulting Inc.